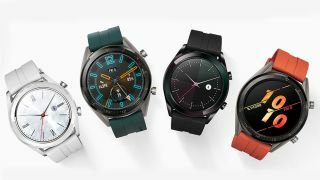 Last year's Huawei Watch GT is soon set to be available in a variety of new colors and styles thanks to some redesigns announced alongside the Huawei P30 range of phones. Two new types of design were announced, and the first is called the Huawei Watch GT Active. This is exactly the same device as last year's smartwatch, but it now comes with a variety of new band colors including orange and dark green as well as a different design around the bezel. That's a standard 46mm version of the watch, but if you're after something a bit smaller there's also the Huawei Watch GT Elegant. This comes in a 42mm case and has a ceramic bezel rather than the metal one. Almost everything is the same on this watch too, but it only comes with a week of estimated battery life, compared to the fortnight of charge expected from all other models. So far we've seen Elegant versions of the watch shown off with a black or white design. There's also a chance the brand may have other looks on offer too. The Watch GT Active is set to cost €249 (about £210, $280, AU$400) while the Watch GT Elegant is €229 (about £200, $260, AU$360). We don't yet know when these will be on sale, or where you'll be able to buy them. The Huawei Watch GT offers some impressive battery life, a 1.39-inch AMOLED display and fitness tracking features. You can read our full Huawei Watch GT review, which we'll be sure to update with the new designs soon. Huawei also used its P30 launch to unveil its first pair of "smart glasses" in partnership with Gentle Monster. Instead of featuring lots of smart tech, these seem to be more focused at being a stylish Bluetooth headset.